Very pretty. But what is it? It’s clearly not a regular exhaust contrail, as the trail seems to start actually ON the wing, and it has a weird rainbow effect you don’t often find in exhaust contrails. It’s actually an aerodynamic contrail. It’s formed by the reduction of pressure in the air as it moves over the wing. When the pressure of a gas falls, then its temperature also falls (the same principle as is used by your refrigerator). The reduced temperature cause small drops of water to condense, which then may freeze. The (frozen) drops get larger as more water condenses on them. The different sized drops (or ice crystals) have different optical properties, which affect different wavelengths of light, which accounts for the “rainbow” effect. The interesting thing about this type of contrail is that they are actually more common in warm weather. They need a lot of moisture, and cold air is generally dry, so they are more common in the summer months, and in warmer climes. See Aerodynamic Contrails Phenomenology and flow physics – Gierens, et al. As aerodynamic contrails are independent of the formation conditions of jet contrails, they form an additional class of contrails which might be complementary because they form in predominantly in layers that are too warm for jet contrail formation. There is actually surprisingly little work being done on the formation of aerodynamic contrails. A lot of the time they only show up as wingtip contrails (which you can see are very dense in the above photo). Conditions need to be just right for the full wing to generate a contrail, and it typically does not last very long at all. 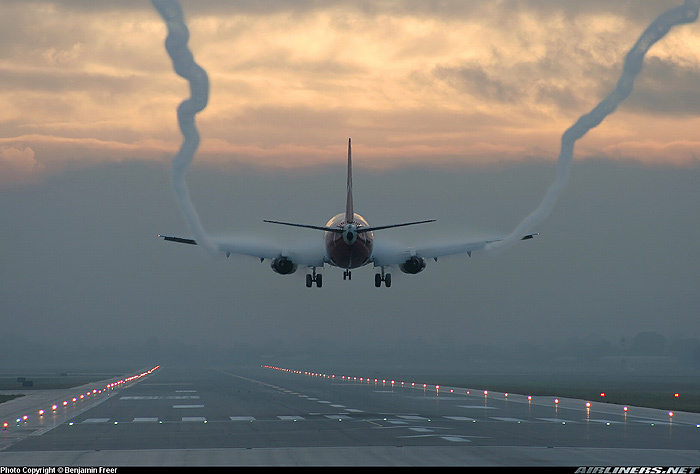 Here you can see the wing contrails vanish almost immediately. The long persisting contrails (which won’t persist very long) are from the outer end of the lowered flaps – where air is compressed and then expanded very rapidly, causing a lot of moisture to condense. You can also see there’s a lot of moisture in the air, it’s quite misty looking. 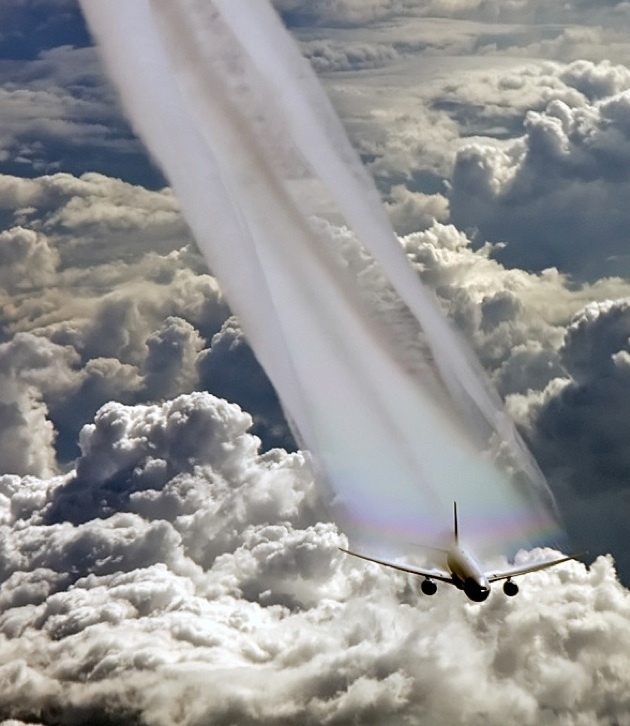 In this shot, you can see the jet seems to be underneath a layer of clouds, suggesting it’s at a low altitude, where exhaust contrails would not normally form. Although with this image, it’s little hard to see what is in front of what. 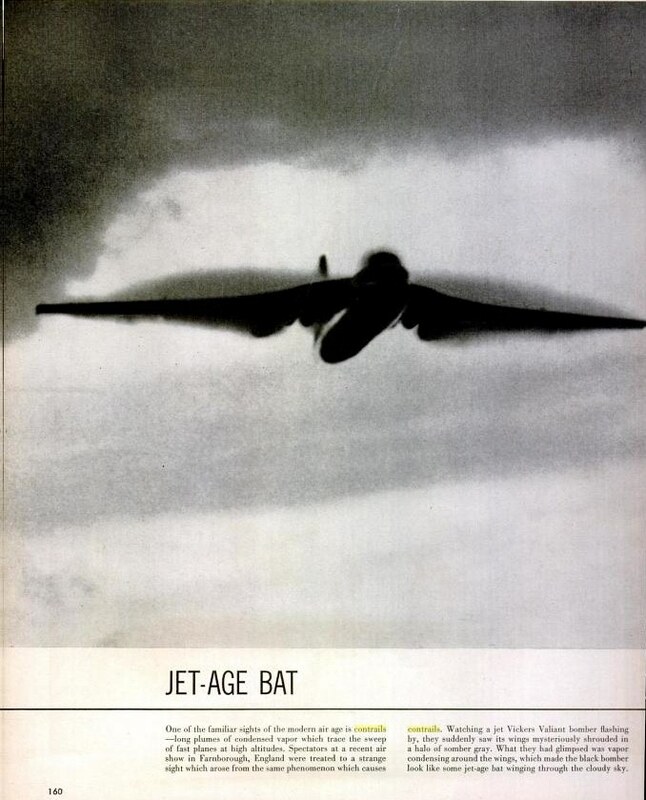 I suspect that the shadow you see near the tail is actually the shadow of the plane on the clouds, meaning the plane is just above them, or in them – in a region of high humidity, either way. 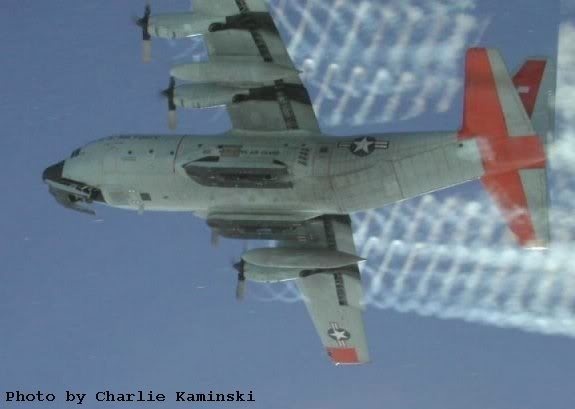 Note you have the thick white contrails coming from the engine, and the aerodynamic contrails coming from the wings. (side note here: most of the photos in jpro747’s set were taken FROM THE GROUND with a Canon 350D ($400) attached to a 1200mm 6-inch Dobsonian telescope ($300-$1000, depending on quality). In most of the shots, you can clearly see the type of plane, and usually the airline markings. Now, why has NOBODY in the supposed 2 Million “chemtrail” community managed to take a closeup photo of a jet spraying chemicals. Considering you can do it with $700 worth of equipment, it seems rather odd). You can see the trail looks very similar to the photos, especially in the final segment of the video. There are few wide shots, so it’s hard to tell how long the trails is lasting for, but at 0:50, the camera pulls back, and the provious trail is either off screen, or has already evaporated. Note this video was shot in Torino (Turin), Italy,on August 16th 2008 – during the summer. 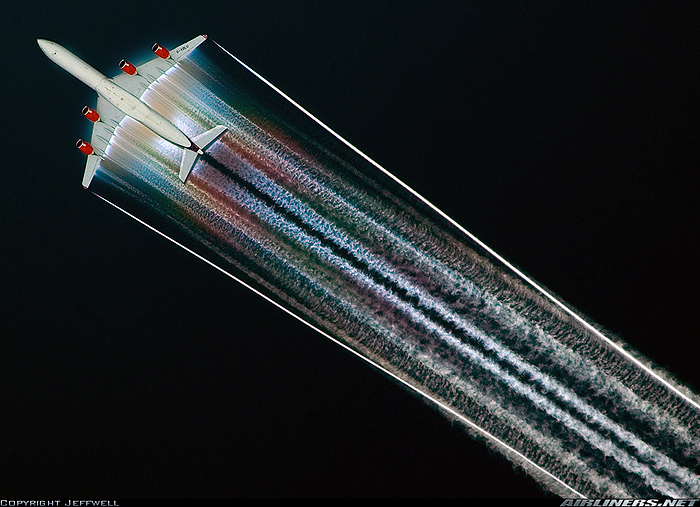 That’s when these type of contrails are more likely, as they need very humid air. Here’s a similar phenomenon. This is taken at a lower altitude, with the the sun just right. This is a bit different as it’s not really a trail – or rather it’s a very short non persistent trail that only exists because of the extreme changes in air pressure from the F-22’s high power maneuvering. Aerodynamic Contrails Phenomenology and flow physics – Gierens, et al. 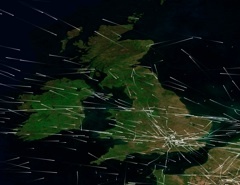 Aerodynamic contrails Microphysics and optical Properties – Gierens, at al. I see. Well, I’ve looked into the above patent. If it were implemented, it would be readily detectable. There would be a noticeable dip in the absorption/emission spectra, significant increases of rare earth elements in the atmosphere, in particular, radioactive thorium, etc. And the costs of manufacture of required amounts of welsbach materials would be sky high. No, maybe you could tell me why you think it means that “chemtrails” exist? I corrected myself, its patent #5,003,186. 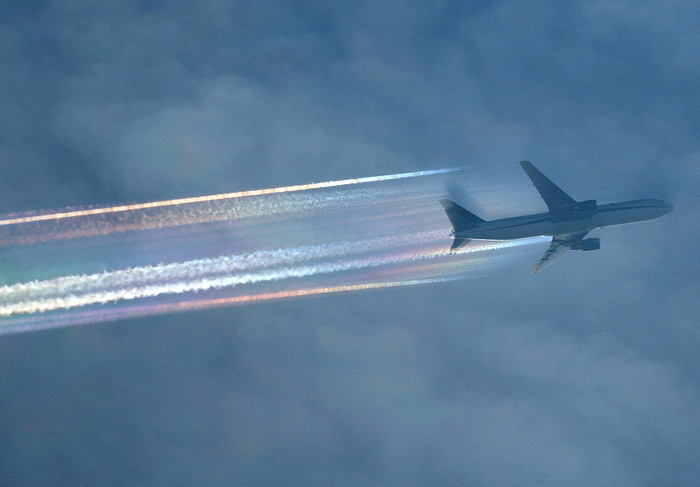 And i will discussing only in the chemtrail myths article from now on. I would agree all these photos are beautifully taken, clear and close up. None of them were taken far enough away to reveal how long the contrails persist (or those shots have not been included). Assuming they are taken on a clear day, without a lot of haze in the sky to dull the photos and assuming the contrails were not persistant, none of these would be a good example of a potential “chemtrail” example. And therefore the camera equipment and skill of the photographer can not be very well compared to the photos of suspected chemtrails which always must be taken at a much lower magnification to include the full length/extent of the trails. Since it is more difficult to catch the first flight of the day than it is to photograph after many trails have apeared in the sky, we can assume that the haze would make it more difficult to get a crisp, clear close up photo taken at the same time as long trails are being whitnessed. 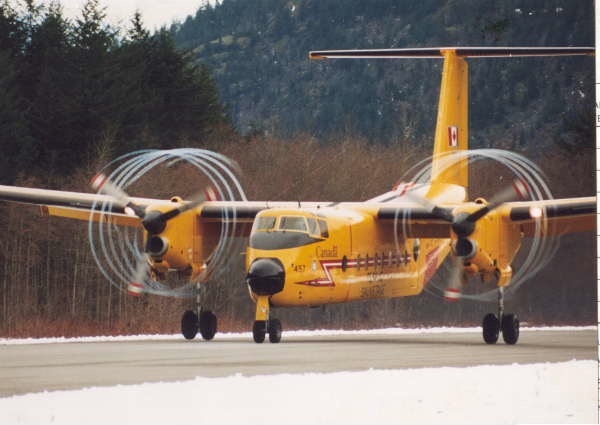 But it’s a great challenge, can anyone photograph a close up shot of the planes responsible for persistant trails in suspect cases of spraying and post them both? I’d say your skills and equipment are well suited for the job! Would you like to volunteer?!!! 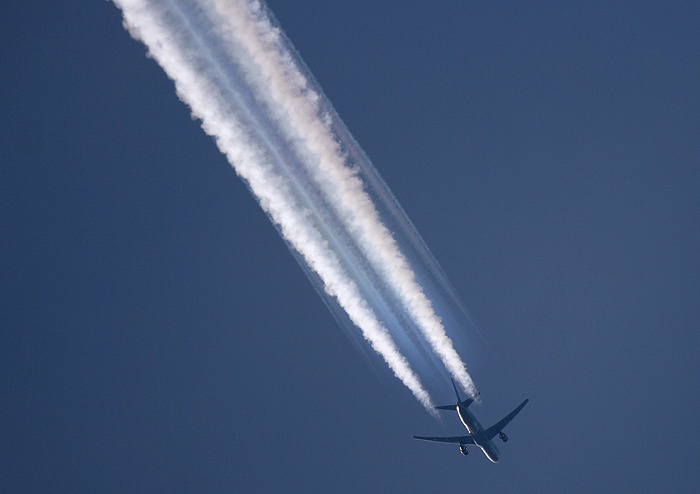 A video panning from an extreme closeup of an identifiable commercial aircraft to a persistent contrail would get accusations of “photo shopping” from the chemmies. It is up to the people who believe in chemtrails to rid themselves of this horrible hoax they have fund themselves embroiled in. Their leaders will not do it. This is how the entire farrago could be solved. Identify the planes, and it would all be over. Well chemtrails are real they spray here almost every day in the great lakes region of north america. If you want the real facts of the open air weather modification programs and geoengeneering please take the time to read this website. Not only does it document the ongoing openly admitted aerosol program but the locations, the companies involved, some of what there spraying, and the people paying for it. some of these companies are claiming to have done this for 60-70years(Weather modification inc.) please take note that the american government is, and has in the past admitted to these programs. The truth shall set you free! Please read fully and then respond please. Ok, the truth in this case is: weather modification inc. does cloud seeding. cloud seeding is done far below the level that contrails usually form at, and it does not create contrail-like clouds. it’s supposed to make clouds rain down before turning into hail. if you had actually looked at their website or looked into cloud seeding you’d know this. So the truth has set me free already, free from the fear of “chemtrails”. thanks.